Don't Look Down: This is a bad sign. I feel like it's been a long week already...and it's only Wednesday. I'm still recovering from my busy weekend at home. Which reminds me, today I was telling my boy about all the things I have coming up for this summer and how I was looking forward to having a free weekend to relax. I believe that I need the weekends to recover from the work week while he informed me that the week is used to recover from the weekends. He lives for the weekends. Admittedly he goes to bed a little early on Thursday so he is all ripped and ready to go for Friday night. How funny. I apparently need to change my perspective on weekends. I'm sometimes amazed by how messy my apartment can get in such a short time. I'm only one person but I make it look like the Tazmanian devil went through it. This was still sitting in my living room tonight. That's my laundry that I did at home this weekend. Three days it has been sitting there. THREE DAYS. 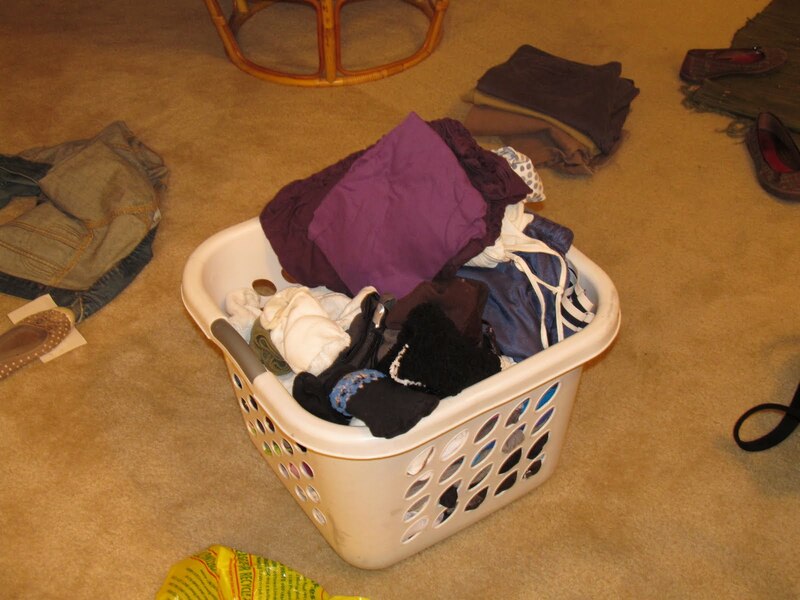 If I need clothes in the morning, I just retrieve them out of the basket in the living room. This weekend, I will be heading home again so I figured it was about darn time I put them away. I bargained with myself, that I wasn't allowed to blog unless I put away the clothes. So the good news is the clothes are put away, but along with the good news comes the bad news. My living room is still mostly a mess...as well as my kitchen. Arg. I completed most of my to-do list for tonight so I am putting those on the to-do list for tomorrow and hopefully it will get done. And hope my week goes quicker while you're at it.